One of the main strengths of the Trellis graphics paradigm is the use of panelling to divide data into subsets to investigate whether patterns are consistent as the conditioning variables change. 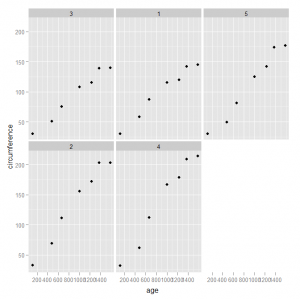 In the ggplot2 package the terminology for specifying these separate panels is faceting and can be used to create similar displays. 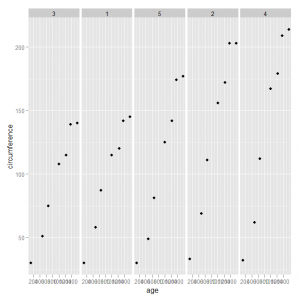 This only scratches the surface of the power of faceting in the ggplot2 library. There are many options that can be controlled to change the appearance to suit a specific set of data.